i have a confession. i just roasted my first chicken last week. there, i said it. now that i’ve done it, i can say that it’s super easy + returns delicious results. i wish i had knew what i’d been missing out on! from now on, i vow to roast a chicken every few weeks, + i’m looking forward to trying different techniques + recipes. if you have any great ones, send them my way, please! a few notes: when i make this again, i may roast it at the higher beginning temperature for longer to get a more golden brown color + crispier skin. also, we used the sliced onions under the chicken (as the recipe suggests) – while they gave a delicious flavor to the chicken, i think i will use a roasting rack next time. the onions didn’t raise the chicken up quite enough to crisp up the bottom. we served this dish with ina garten’s oven-roasted potatoes, asparagus + green beans with fennel, which was a delicious accompaniment to the chicken + a side dish that i will absolutely make again. look for that recipe on the blog in the future! + remember, tell me about any great roasted chicken recipes/techniques you have – i can’t wait to roast another chicken! preheat the oven to 450ºF. in a mortar + pestle, mash the garlic with the salt until smooth. add the chervil, tarragon, thyme, + parsley + mash together to a paste. add the butter + mash together until the mixture is smooth + uniform. loosen the skin from the surface of the chicken, taking care not to tear it. you can do this with by sticking your first + second fingers between the skin + the meat, starting from the breast near the neck + moving them carefully over the surface of the bird. you can also do it with a teaspoon, rounded side out. season the chicken, inside the cavity + outside, with salt + pepper. spread the butter under the skin, concentrating on the breast + down into the legs. truss the chicken + pat the surface dry with a paper towel. if using the onion (the sliced onion acts as a rack and will infuse the chicken with more flavor), toss with 1/4 teaspoon salt + 1/4 teaspoon freshly ground pepper, + place in the middle of a lightly oiled baking dish. place the chicken on top, breast side up. if not using the onion, set the chicken on a lightly oiled rack, breast side up. place in the oven + set the timer for 15 minutes. after 15 minutes turn the heat down to 350 + continue to bake for one hour, until a thermometer registers 160 when stuck into the thickest part of the thigh. remove from the heat + let stand for 10 minutes before serving. discard the onion. I love roasted chickens! My parents made them a lot for dinners when we were growing up, so they always remind me of home. Plus, they provide great leftovers for sandwiches the next day. Win win! my mom used to make them for dinner a lot, too, so that’s exactly what i associate them with – home + comfort food! i still can’t believe i waited so long to try my hand at roasting one – it was much easier than i expected! Your chicken looks beautiful! 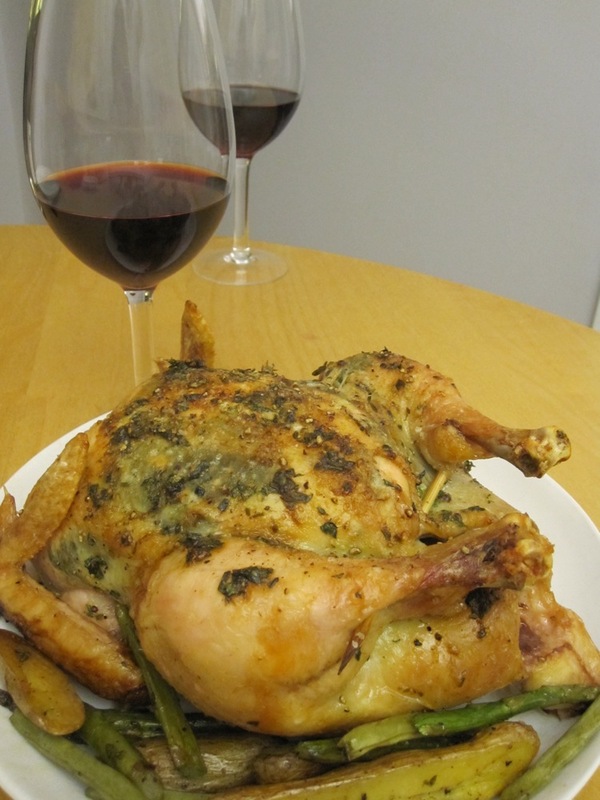 I also grew up eating Mom’s roasted chicken – total comfort food in my book. I haven’t tried this version, the herbs are different than the ones I usually use. I plan on trying this but agree with using the roasting rack. My Mom’s version had a greek spin (as she was straight from the old country) and I can honestly say it’s the only way I’ve ever made roasted chicken. Time for me to switch things up! thank you so much for saying that! i know it’s not my best picture ever, but roasted chickens aren’t the easiest to photograph. =) i didn’t know that you had greek roots – i love greek food + have some really great greek recipes that’ll be on the blog in the future. what sort of seasonings/spices do you put on your roasted chicken? i’d love to try your greek recipe! 6 potatoes (I prefer Yukon Gold). In cavity, put garlic clove, 2 sprigs each of parsley and thyme and 1/4 of the lemon. Rub chicken with olive oil and squeeze remaining 1/4 lemon. Season with salt, pepper, garlic powder, remaining 1 sprig of thyme and dried oregano. Wash potatoes and dry. Cut into large chunks. Spread potatoes on the bottom of a roasting ran. Drizzle with olive oil and season with salt, pepper, dried oregano and juice of 1/2 the lemon. Toss to coat evenly. Place on potatoes and roast for approximately 1 1/2 hours or until juice run clear. Remove chicken from pan and let rest for 15 minutes. Stir potatoes in pan to recoat with sauce. thank you so much! i think i’ll put this on the menu for this weekend or next. =) will let you know how it turns out!